In a departure from the past few World Series, this year’s contest between the Chicago Cubs and Cleveland Indians contains two teams that were both: a) highly regarded before the season began and b) played well for most of the year.1 (No flukes here!) The average of the teams’ pre-Series Elo ratings — a measure of a team’s strength at any given time2 — ranks ninth among the 22 World Series matchups since the wild card era began in 1995 and 37th out of the 91 since the current 2-3-2 best-of-seven World Series format was adopted in 1925.3 In other words, it’s a solid matchup. And how about competitiveness? For each World Series since 1925, I plugged the teams’ pre-Series Elo ratings into a best-of-seven probability formula and calculated each club’s odds of winning the Series. Chicago’s win probability of 60.3 percent in FiveThirtyEight’s basic Elo model4 is larger than the average for favorites since 1925 (59.5 percent) and for favorites since 1995 (57.8 percent). So this series is more lopsided than the typical championship matchup — as you might expect when one of the top couple dozen teams of all time is involved. 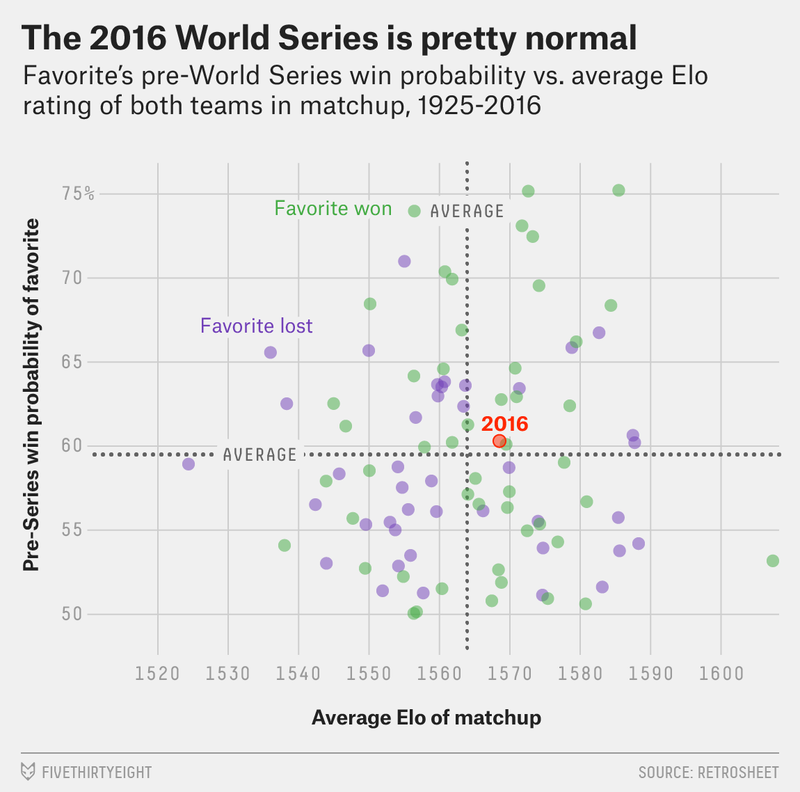 But take heart, Indians fans — World Series upsets appear to happen more frequently than basic Elo would predict. Based on the pre-Series probabilities I crunched, the favorite would have been expected to win the World Series 54 times in 90 tries since 1925, for a predicted winning percentage of 60 percent. In reality, however, favorites won only 49 times over that span, for a success rate of 54 percent. Whether that’s because basic Elo can’t pick up on the differences between regular-season and playoff baseball,5 I’m not certain. But it is a sign that the Series might be more competitive than Chicago’s 60.3 percent win probability indicates. That’s bad news for anxious Cubs fans hoping to end a 108-year championship drought. But it’s good for Cleveland, as well as agnostic observers (such as myself) who want the baseball season to last as long as it can. The 2015 Mets and the 2014 Royals each flirted with .500 on their way to the World Series, and expectations for the 2013 Red Sox were low after a terrible 2012 season. Specifically, the simple version of Elo found in our Complete History Of MLB interactive, which doesn’t account for starting pitchers, travel distance or rest days when assessing each matchup. Before 1925, the World Series format was either best of seven with home-field advantage for seventh games determined by coin flip or best of nine, so there wasn’t a common format to be readily compared with modern series. Which, again, differs slightly from the 63 percent figure in our interactive graphic, which uses the more complete model. Such as shorter rotations and shallower bullpens, both of which favor underdogs with more star pitchers than depth.